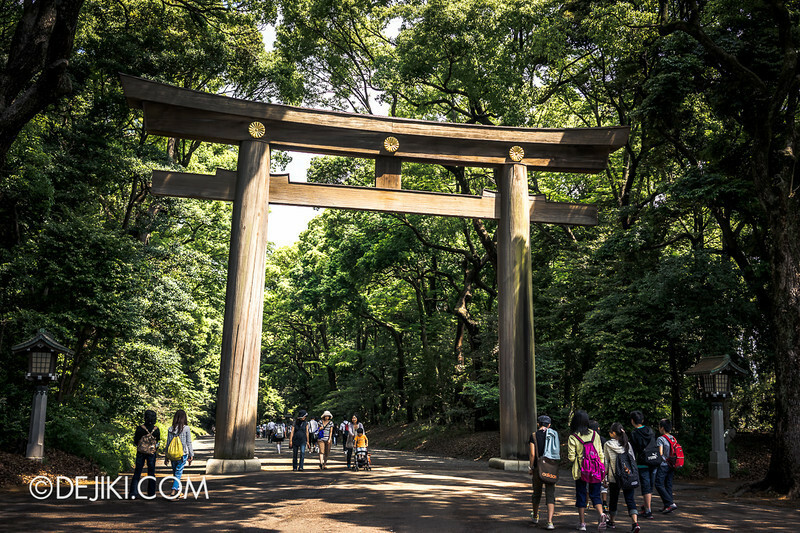 Set in a lush forest, the Meiji Shrine is one of the most iconic attractions in Tokyo, Japan. 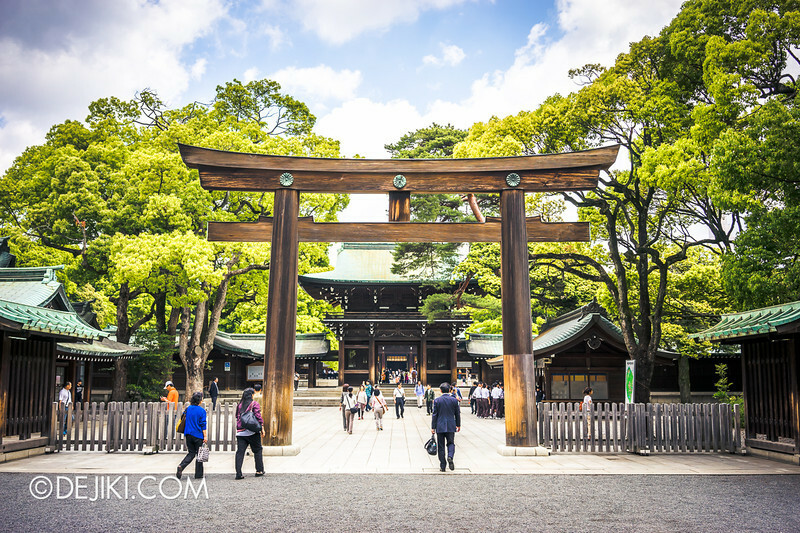 My visit to Meiji Shrine (also known as Meiji Jingū) was a last minute decision. 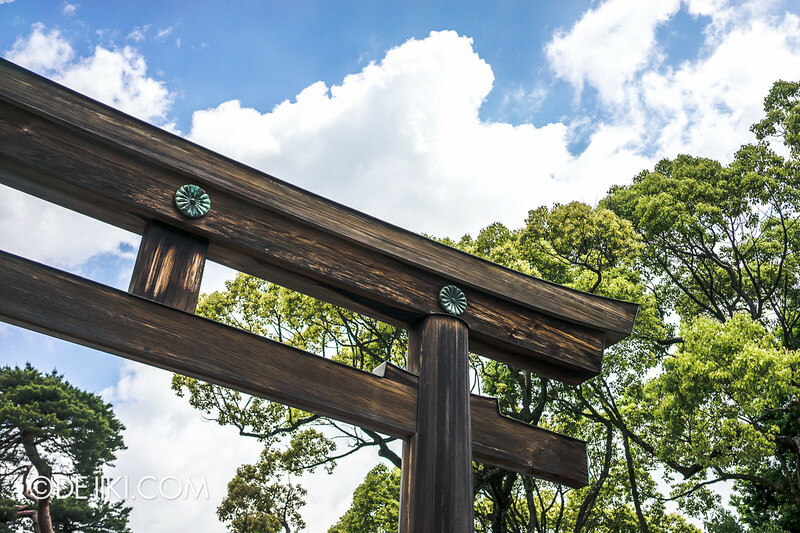 I planned a two-day shoot at Tokyo Disney Resort but decided to complete it in one day due to erratic weather. The rain had tested my patience and endurance. Giving up a day at one of the world’s best theme parks is of course a tough decision for someone like me to make, but I’m glad I explored the city instead. 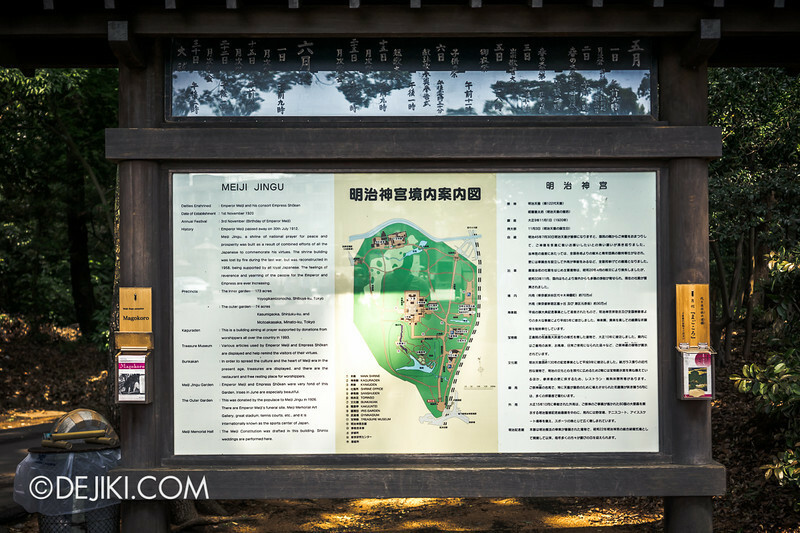 I’ve never visited the Shrine (or someplace similar) before, so walking alone through its sprawling forest was soothing. 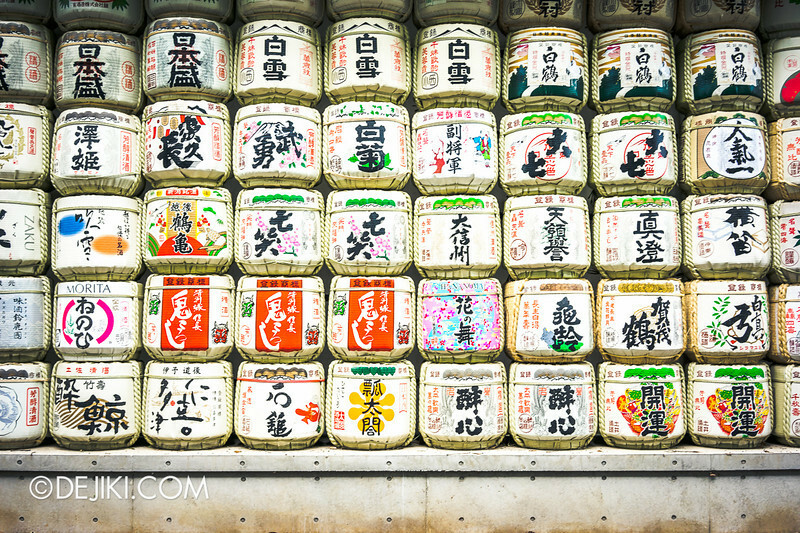 A display of sake (Japanese rice wine) barrels. 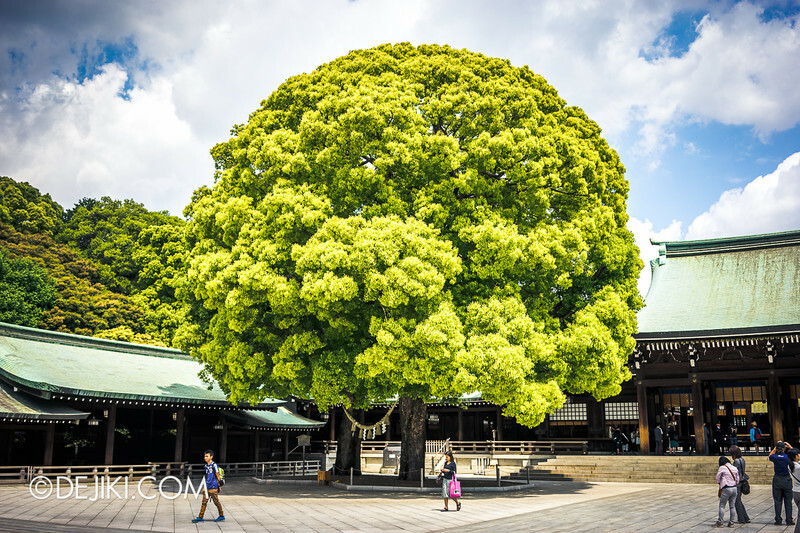 The tall trees masked out the outside world – noise from traffic, city buildings. 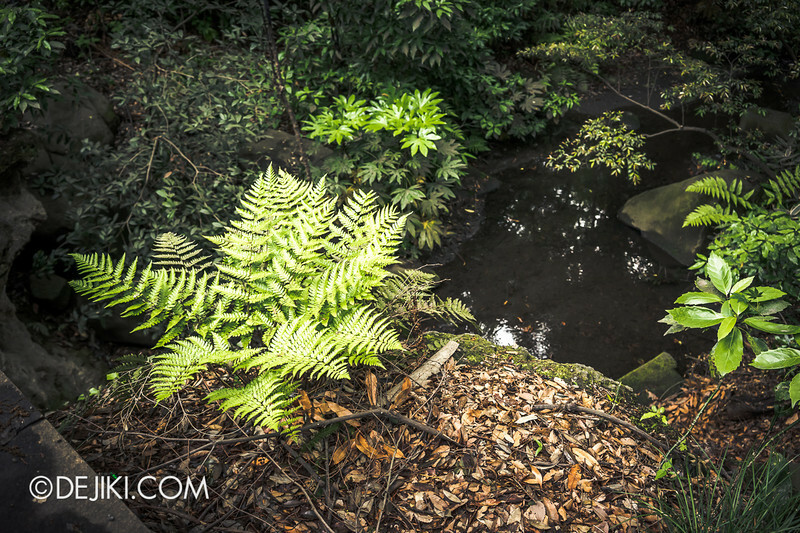 Breaks in foliage let fragments of the sky seep through. It was a walk in serenity. 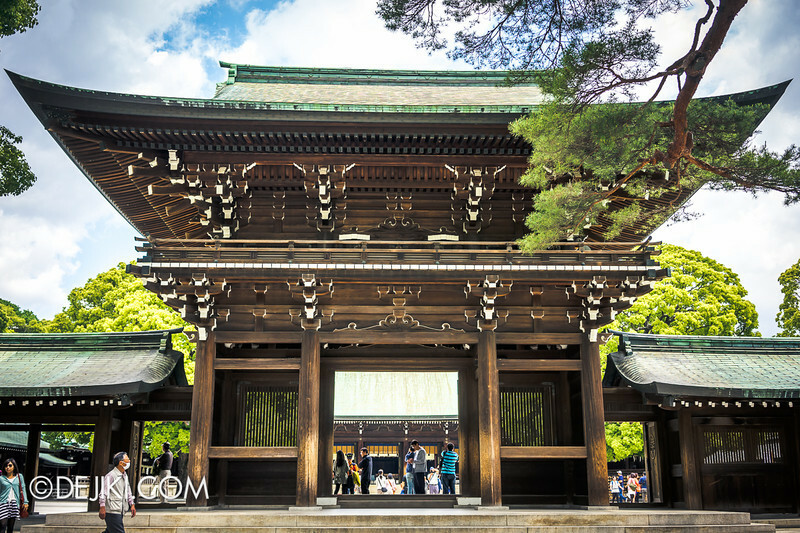 Apart from a Treasure Museum and the inner garden, the key attraction is of course, the main hall of Meiji Shrine. 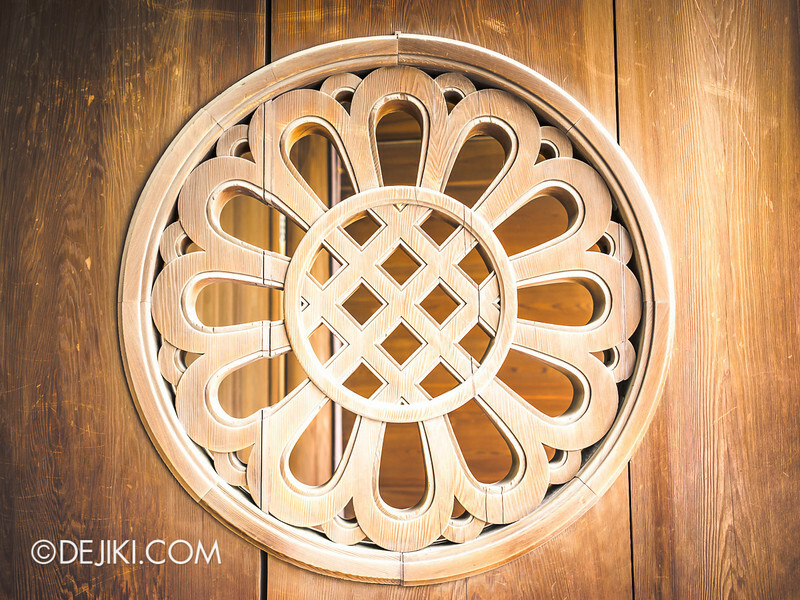 The Chrysanthemum is a symbol that surrounds the Emperor and Imperial Family. 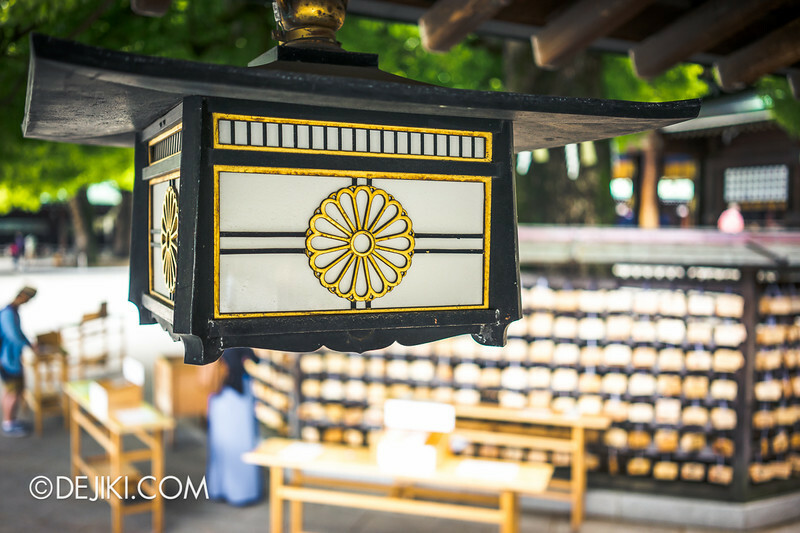 At Meiji Shrine, variations of the Chrysanthemum Flower Seal are seen as ornaments on gates and lamps. 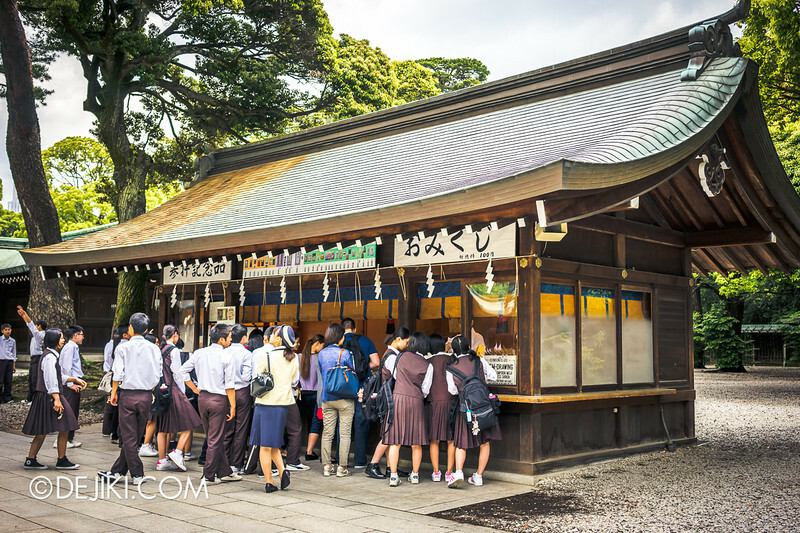 The main hall is where visitors partake in a ritual of throwing coins (usually ¥5, or ¥50 coins) and saying a prayer, or wish. 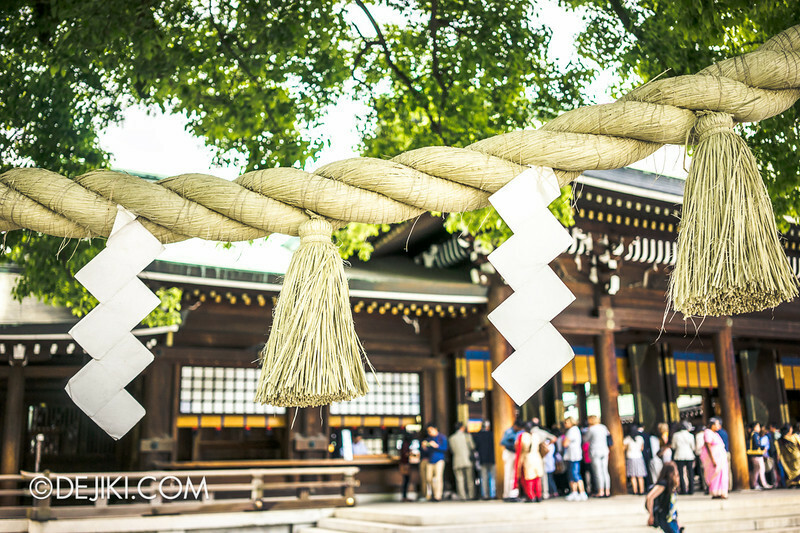 Shimenawa – a straw rope with shide, white zigzag streamers, marks the sacred ground. 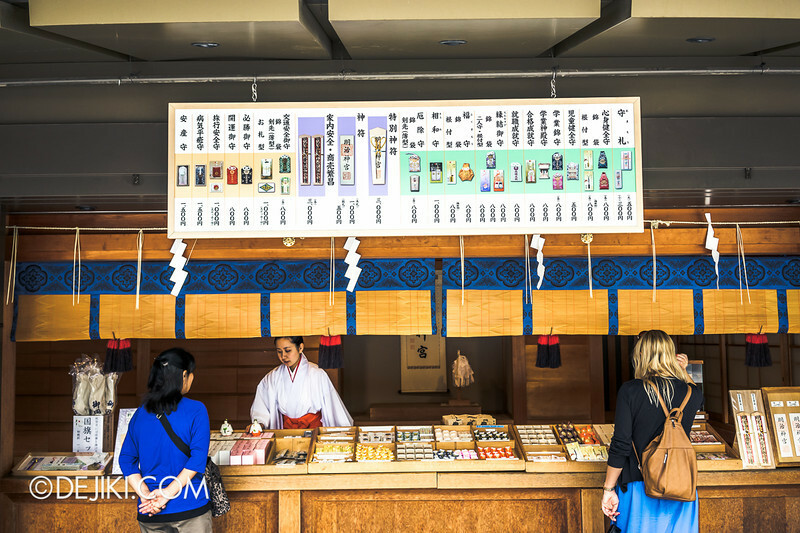 A large variety of omamori (amulets, talismans, or charms), can be purchased at two counters near the Shrine building. From health, wealth, academic success, to love, these small charms are decorative cloth pouches that hold a small wooden talisman inside. All of them are embroided with a Golden Chrysanthemum. 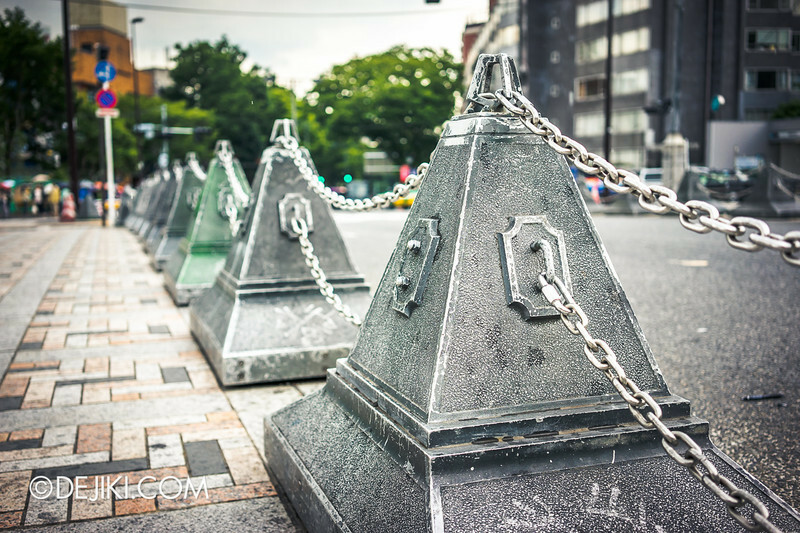 Even if you don’t believe in this sort of good-luck charms, they make nice souvenirs. Most charms are ¥800 each. 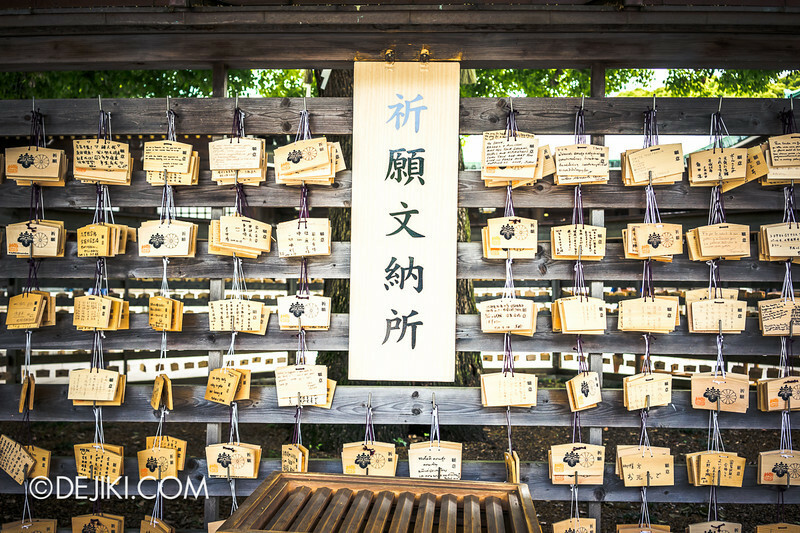 Near the main shrine, you’ll find walls filled with ema, or “wishing boards”. 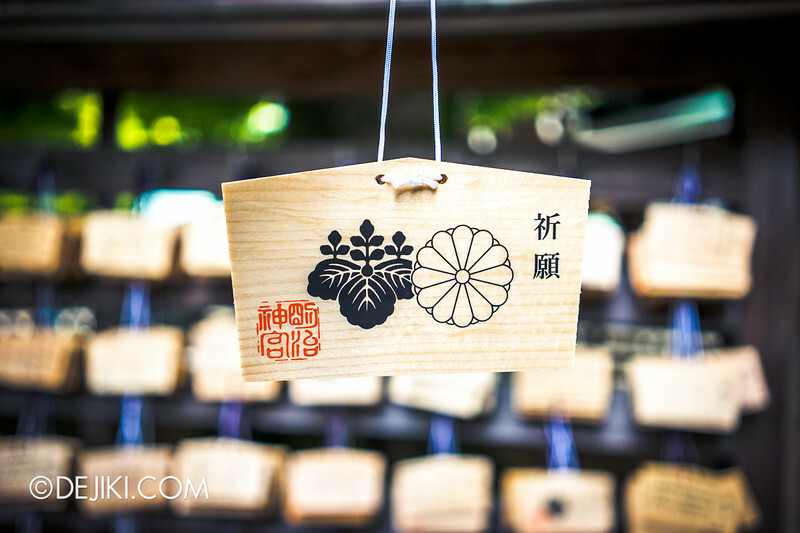 For ¥500 a piece, you get a nice wooden block to write your wish and hang it with everyone else’s. 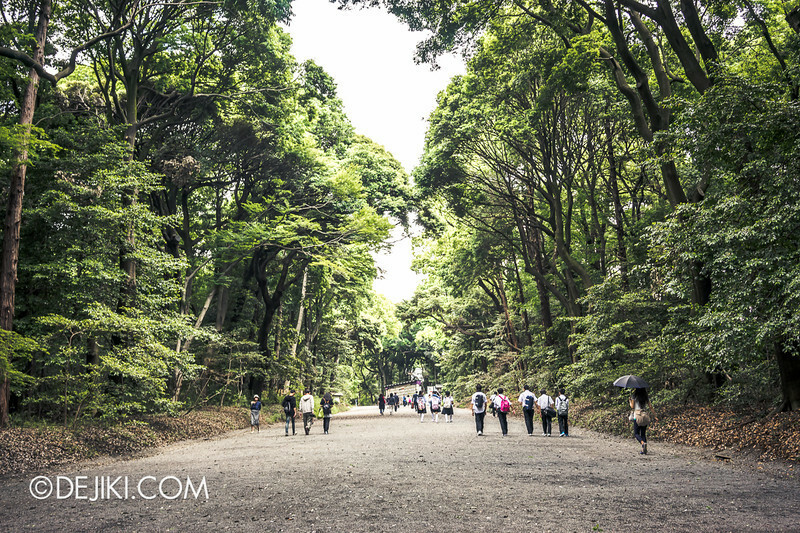 Once you’ve found your inner peace, walk out of the forest slowly, and the buzz of Tokyo traffic will gently ease in. 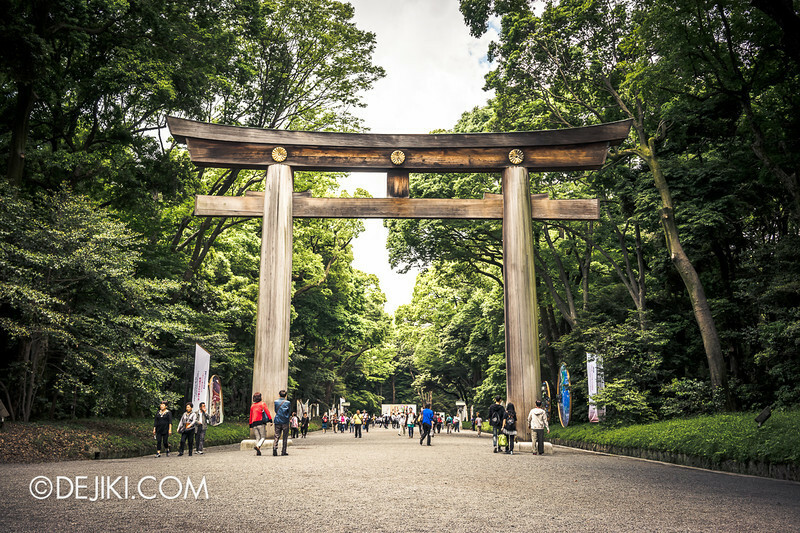 Meiji Shrine is conveniently located near the Harajuku (JR Yamanote) station, which is linked via underpass to the Meiji-jingumae ‘Harajuku’ (Tokyo Metro) station. 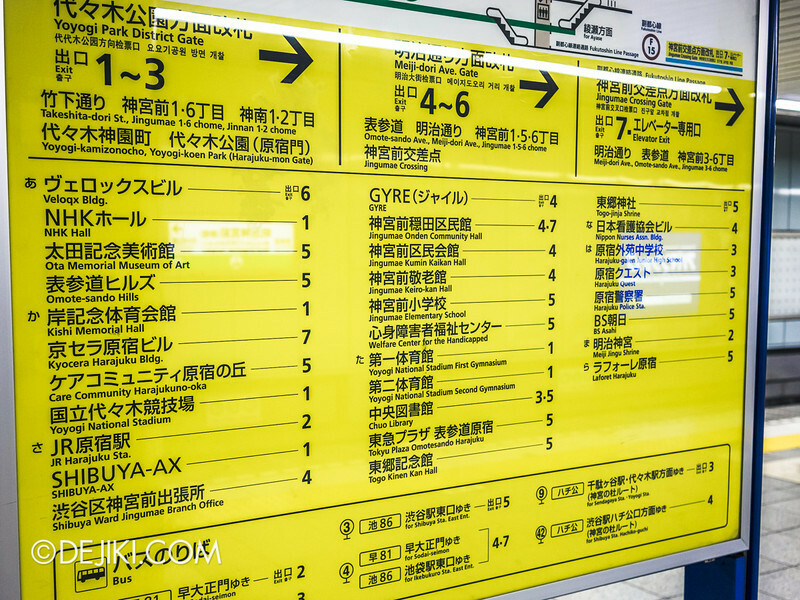 The nearest way out to the Shrine’s Harajuku-facing gate is Exit 2.